Far too many ‘accidents' begin this way. This article is in response to my extreme frustration, anger, and sadness after seeing the senseless death of a child. As a firearms instructor, I come into contact with gun owners of all experience levels. Regardless of their shooting experience, there is one aspect of gun ownership that is non-negotiable and universal. Firearms safety is just something that cannot be compromised and there is no instructor worth their salt, who would disagree. So why are we here again? Another “accidental shooting” with facts all too familiar. According to the Indianapolis Police Department, a 2-year old died from a single self-inflicted gunshot wound, after gaining access to his mother’s concealed carry firearm. 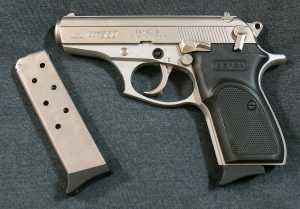 The firearm was identified as a Bersa Thunder .380 (more on the importance of the model of firearm later). The firearm was retrieved from inside the mother’s purse, which was left unattended on the kitchen counter. The mother and 2-year old were the only ones home during the incident. The IndyNews news article can be found here. Never missing the opportunity to exploit a tragedy, anti-gun groups point to how dangerous guns are. This may sound strange, but I agree, guns ARE dangerous…when not handled correctly. Just like automobiles, prescription medication and power tools, guns can be an invaluable tool when used correctly, and a devastating force, when used recklessly. We have to take responsibility when we do things that are inherently dangerous. When we don’t, WE are to blame, not the object. This is the distinction these anti-gun groups fail to understand. In this case, the child’s mother is 100% culpable in the death of her child. I know that sounds harsh given the mother’s loss, however, I am not here to candy coat words. It is no more an accident to leave a loaded gun in an area accessible to a child than it would to leave a power saw running and accessible to a child. 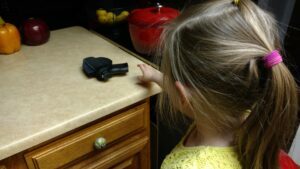 Guns and Kids can co-exist in the same home, as long as we adhere to the safety rules. The shooting is reported as an “accidental shooting” as is status quo in the media. I draw a big distinction between “accidental discharge/shooting” and “negligent discharge/shooting.” I classify a true accidental discharge as a fired round that occurs through no fault of the gun owner. Treat EVERY weapon as if it were LOADED: Always assume the firearm is loaded until YOU perform an inspection on the firearm. No matter what, don’t take anyone else’s word that it is unloaded. Never point a weapon at anything you do not intend to shoot: Simple if you do not want to put a hole in it, do not point the firearm at it. 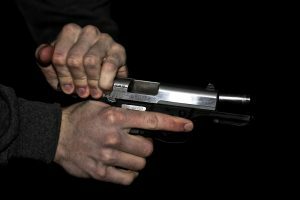 Keep your finger straight and OFF the trigger, until you are ready to fire: Most firearms do not fire without manipulation of the trigger. If you keep your finger off the trigger until you are ready to shoot the can save yourself major problems. 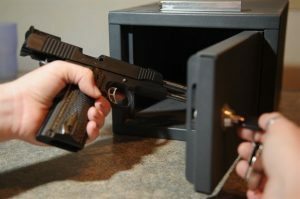 Keep the weapon UNLOADED until ready for use: This means, if you have a firearm on your person, in a hideaway, or in a safe that is dedicated for home defense, it is ready to be used for that purpose and should/may be loaded. If it is not being used for that purpose, it should be unloaded. If you remove your everyday carry gun from your waist and place it on the kitchen counter so you can unload groceries, it is no longer being used. It is now an unattended, loaded firearm. 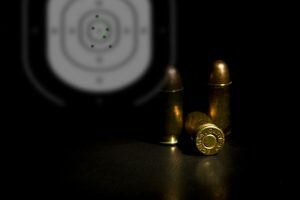 Identify your target and what lies BEHIND it: If you have only ever shot on a range, you may have never thought about the fact that bullets travel through the target sometimes. In real life, you most likely won’t have a 20-foot backstop directly behind your attacker. Also, most shooters infrequently miss the target. Yeah, right. You may re-evaluate your decision to take a shot, or you may change the angle between your attacker and you for a better backdrop after you identify what is behind your target. The last thing we want, is over-penetration of the threat, or a full on miss, resulting in injury to an unintended person. In addition to the safety rules, I teach my students that it is THEIR responsibility to store their firearms and ammunition in a way that will not be accessible to unauthorized includes felons, those with mental health issues and CHILDREN. I know a lot of people will use this tragedy as yet another example of why off-body carry is a bad, bad idea. I agree, off body carry is not ideal and should be an extreme last resort method of carrying. I do not recommend anyone off-body carry, but I understand that there are going to be one or two of the millions of gun owners who ultimately choose to carry off-body. For those of you who have made the decision to do so, you MUST take some extra steps for safety’s sake. You must make sure that you are diligent in ensuring that your purse or bag is not accessible to anyone besides you. You must carry the firearm in a holster that secures the firearm inside your purse or bag. You must remove the firearm from the bag when it is not physically on your body, within arms reach or within sight. I mentioned the type of gun used in this tragic incident because it is a HUGE factor that may be glossed over. The type and function of the gun makes me want to investigate the facts of this incident even more. The 2-year old shot himself with a .380 Bersa Thunder. This is important because firstly, the Bersa Thunder is a traditional double action pistol. This means that the initial trigger pull requires much more force to fire. Depending on the actual Bersa Thunder .380 model, this initial trigger pull needs around 8-10 pounds of pressure to pull the trigger. This is a LOT of pressure for a 2-year old to apply. In single action mode, the Bersa Thunder takes about 3-4 pounds of pressure. Furthermore, the Bersa Thunder, has an external safety/decocker. This means that if the safety is applied, the firearm cannot stay in single action mode because application of the safety automatically returns the gun to double action mode, and the safety must be manually switched off to fire. Additionally, the Bersa Thunder has a lockable trigger safety that when engaged, requires a small key to unlock the trigger. Without the key, the gun cannot be fired. All this is critical because all of these safeties point to this gun as being one of the safest guns a person could own. So this has me wondering, was this 2-year old very strong, or was the pistol left in single action mode (hammer cocked), and off safe? Was the firearm not in any type of holster inside the purse that would provide a level of retention and protection from trigger manipulation? Or, maybe the skeptical former cop in me thinks that there may be more to the story. In any case, this story shows that all the mandatory safeties and devices are worthless if WE don’t act as the ultimate firearm safety. Smart gun technology, legislation, pad-locks, you-name-it are worthless if the gun owner doesn't take responsibility in his or her own gun. I am a big supporter of Project Childsafe, a pro-gun organization that encourages gun safety for children. They provide training and free gun locks to millions of gun owners a year! Do not take firearm safety for granted. Do not become complacent. Err on the side of caution. Just as you would teach your children not to go near a fire or a busy street, and not play with cleaning chemicals as soon as they are old enough to crawl, teach them that guns are not toys and that they should never touch them. Firearms save far more people than they “accidentally hurt.” Firearms can be safe when handled safely, and dangerous when handled recklessly. Train, seek instruction and stay safe. Keep your family safe by securing your firearm when it is not on your person! God Bless.